A dental implant is a device, usually made of titanium that replaces the tooth’s “root” and allows the placement of prostheses such as dentures, crowns, and bridges. They make it possible to restore full teeth even to people who have lost all of their own. A skilled dental team will assess the condition of the patient, and plan a dental implant procedure that suits that patient’s needs. It can take some time, as it requires not only someone to manufacture tooth replacements, but someone to plan and place them, and yet another specialist to perform the delicate surgery. 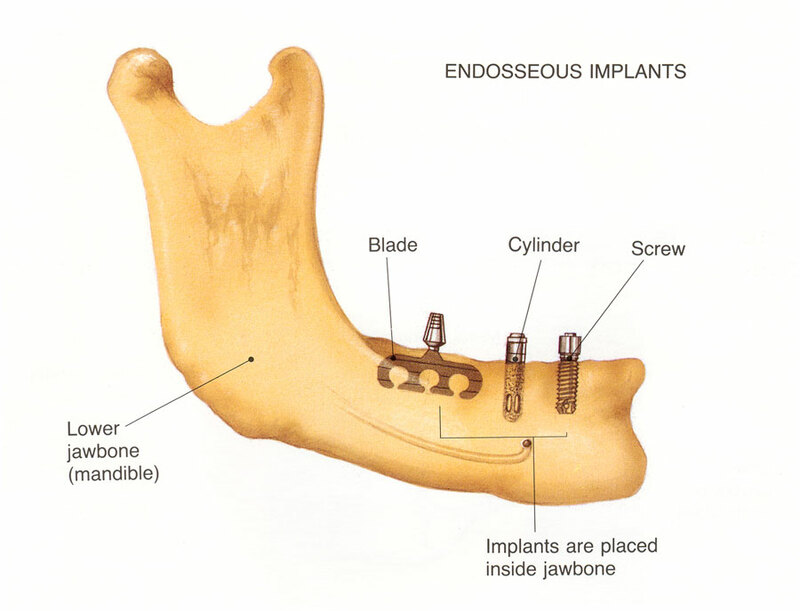 Precise holes will be drilled into the bone of the jaw and an endosseous (which means “in bone”) implant will be placed. Then a wait period that can be anywhere from 2-6 months must elapse before the implants will have fused directly with the bone, creating a permanent place to anchor dental restorations. Tooth Replacement (Single): After the removal of a tooth for any reason, it is possible to immediately (or after a short period of healing) create an implant for the attachment of a single tooth. A single abutment is placed, and a tooth – created by the dental technician to match your existing teeth – is placed. Tooth Replacement (Multiple): Obviously, multiple implants hold more teeth. In the case of a full lower or upper denture replacement, several implants will be used, but not at a 1:1 ratio. The use of bridges and full dentures is possible, thereby halting bone loss due to missing teeth. Recent Developments in Multiple or All Replacements: All-On-4 implants allow for the placement of a full dental prosthesis (all teeth) on only four dental root implants, strategically placed for stability. The procedure reduces cost and recovery time, and is rising in popularity.